Ibérico ham from Spain. Air-cured jámon is a Spanish culinary icon and a true pleasure for the taste buds. Our Ibérico ham is crafted by fourth-generation maestro jamoneros - literally 'masters of ham'- who oversee curing rooms at high altitudes in the fresh, clean air of the Rasillo de Cameros Mountains. Their techniques marry the best of tradition with the latest in technology. This Spanish-cured ham needs to be handled properly for the best experience. Be sure to trim the thick layer of yellow fat off before carving, but only in the area you are going to carve. This is a natural build-up that occurs in the long curing process as a barrier to the air, but it is bitter tasting, and not suitable for eating. 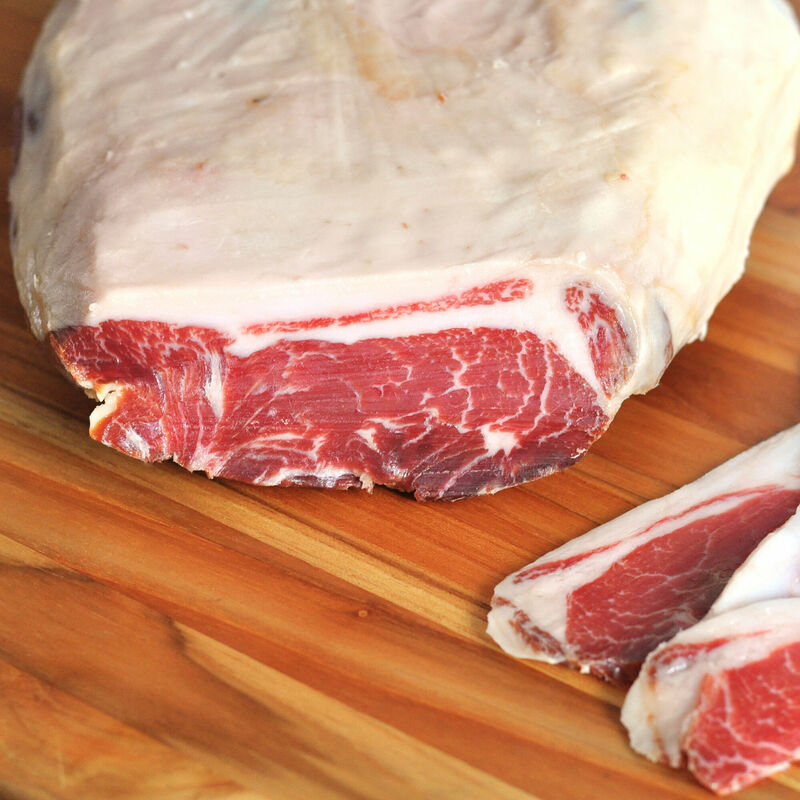 Cured ham is best served at room temperature, so bring up to room temperature before slicing and eating. If the surface looks dry, put olive oil on a cloth and place over the dry area. Store Ibérico ham in the refrigerator, wrapped in plastic. If you are using a deli-style slicer, it will be easiest to cut thin slices when the ham is cold. Bring it down to nearly freezing – but do not freeze it! – and run it through the mechanical slicer. Individual slices can be laid on wax paper and stored in a sealed plastic bag. You can also divide the ham into smaller pieces, to share with family and friends, or for your own use, to eat a little at a time. When left alone and unsliced for a while, the ham may develop some salt residue on the surface, or mold. Simply cut away that surface area and the ham underneath will be safe and tasty to eat. They use rare-breed pork from Black Iberian and Mangalica hogs, which are raised humanely on pasture. The hams are cured at high altitudes in the fresh, clean air of the Rasillo de Cameros Mountains in Spain, using nothing but salt and time.